This is a list of contiguous urban areas of the world ordered according to population as of 2013/2014. The figures here have been taken from Demographia's "World Urban Areas" study. Demographia defines an urban area (urbanized area agglomeration or urban centre) as a continuously built up land mass of urban development that is within a labor market (i.e. metropolitan area or metropolitan region), without regard for administrative boundaries (i.e. municipality, city or commune). Except in Australia, the authorities use a minimum urban density definition of 400 persons per square kilometer (or the nearly identical 1,000 per square mile in the United States). Demographia uses maps, satellite photographs to estimate continuous urbanization. Demographia also uses small area population data, where available, to match population estimates to urbanized land area. National census authority data are presented in Australia, Canada, France, Norway, Sweden, the United Kingdom and the United States. Census of India urban agglomerations are not used in some cases because the geographical size of constituent units (municipalities) often includes large rural (non-urban) areas. The projected year (2013) population estimate is further calculated from the base year population estimate using population growth rate based upon the United Nations population growth rate with some exceptions. 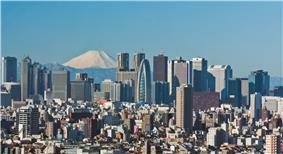 According to the report, there are 875 identified urban areas in the world with 500,000 or more population as of 2013. Demographia released along with the report a disclaimer, that this list of data is compiled on best available information, that of the vary nature of which is changing rapidly and quality is improving as it becomes available, yet still remains highly variable between nations, hefty revisions are not unforeseen for the future. Appropriate caution is therefore advised. 224 Urban Areas with population of over two million. ^ Includes large areas of Tokyo, Kanagawa, Chiba and Saitama prefectures and small areas of Gunma, Tochigi and Ibaraki prefectures. Excludes urban areas of Utsunomiya (500,000; 119 km2) and Mito (500,000; 246 km2). ^ The population is higher than other agglomeration estimates (such as the United Nations), tend to be limited to Metro Manila, which is a province level jurisdiction. The continuous urbanization of Manila extends outward into Bulacan, Cavite, Laguna, Rizal and Batangas provinces. The Demographia population estimate is a “build-up” of municipality population within the continuously developed area (urban area or agglomeration). ^ a b c d e f Shanghai, Hangzhou, Nanjing, Suzhou, Wuxi, Ningbo, Changzhou, Shaoxing, and urban area of Zhangjiaggang-Jiangyin within the prefecture-level cities of Suzhou and Wuxi are treated as separate urban areas which constitute the Yangtze River Delta economic zone. Huai'an (1,856,000; 148 km2), Xuzhou (1,246,000; 233 km2), Nantong (1,036,000; 233 km2), Lianyungang (985,000; 155 km2), Zhenjiang (983,000; 168 km2), Yancheng (797,000; 207 km2), Huzhou (690,000; 111 km2), Taizhou (in Jiangsu Province; 300,000; 117 km2) and Suqian (220,000; 36 km2), as well as urban areas of Yangzhou (1,593,000; 233 km2) and Gaoyou (180,000; 39 km2) within the prefecture-level city of Yangzhou, urban areas of Kunshan (1,596,000; 492 km2), Changshu (1,139,000; 285 km2) and Taicang (523,000; 117 km2) within the prefecture-level city of Suzhou, urban areas of Cixi (1,200,000; 298 km2) and Yuyao (650,000; 122 km2) within the sub-provincial city of Ningbo, urban areas of Jiaxing (1,044,000; 259 km2) and Tongxiang (510,000; 52 km2) within the prefecture-level city of Jiaxing, urban areas of Wenling (510,000; 52 km2), Jiaojiang (375,000; 41 km2) and Huangyan (200,000; 34 km2) within the prefectrure-level city of Taizhou (in Zhejiang Province), urban areas of Zhuji (500,000; 117 km2) and Shangyu (400,000; 158 km2) within the prefecture-level city of Shaoxing, urban areas of Yiwu-Dongyang (925,000; 233 km2), Jinhua (520,000; 186 km2), Yongkang (500,000; 223 km2), Dongyang (260,000; 104 km2) and Lanxi (220,000; 34 km2) within the prefecture-level city of Jinhua, and urban area of Fuyang (450,000; 49 km2) within the sub-provincial city of Hangzhou are also excluded. ^ a b c d e f g h Hong Kong in the Hong Kong Special Administrative Region and Shenzhen are treated as separate urban areas because of the lack of freedom of labor movement without trade, immigration or customs barriers. Guangzhou–Foshan, Shenzhen, Dongguan and Zhongshan are also treated as separate urban areas which constitute the Pearl River Delta economic zone. While Guangzhou and Foshan are combined into a single urban area because they have become more economically integrated than the other urban areas, other areas in the Pearl River Delta economic region remain classified as separate urban areas. Thus, urban areas of Huizhou (1,387,000; 168 km2), Zhuhai (1,274,000; 246 km2) and Zhaoqing (500,000; 65 km2) as well as urban areas of Jiangmen (920,000; 259 km2) and Taishan (204,000; 44 km2) within the prefecture-level city of Jiangmen, urban area of Lishui (300,000; 44 km2) within the prefecture-level city of Foshan and urban are of Macau (560,000; 21 km2) in the Macau Special Administrative Region are excluded. Urban area of Guangzhou–Foshan includes Shunde within the prefecture-level city of Foshan, which has been excluded in the 2011 edition. Urban area of Shenzhen includes Huiyang within the prefecture-level city of Huizhou, which has been excluded in the 2010 edition. Urban area of Huizhou includes only Huicheng District. The Demographia estimate for Dongguan is lower than last year, because local estimates previously used were higher than reported in the 2010 census. ^ a b Mumbai and Kalyan are treated as separate urban areas, although the census of India classifies Kalyan within the Mumbai agglomeration. Kalyan is excluded by Demographia because of the lack of continuous urbanization with Mumbai. Urban area of Mumbai includes Panvel and Navi Mumbai, but excludes urban area of Vasai–Virar (1,147,000; 91 km2) and Bhiwandi (737,000; 52 km2), which have been included in the 2011 edition. A large part of the municipality of Mumbai is rural, composed of the Sanjay Gandhi National Park and thus not included in the urban area. ^ a b Includes Eslamshahr and Karaj which has been excluded in the 2012 edition. ^ a b Tianjin and Tangshan are treated as separate urban areas. Urban areas of Cangzhou (500,000; 130 km2) and Langfang (465,000; 130 km2) as well as urban area of Qian'an (400,000; 168 km2) within the prefecture-level city of Tangshan are also excluded. The population of the urban area of Tianjin is lower than other estimates (such as the United Nations), which include metropolitan area population not within the continuously developed urban area. The Demographia population estimate is a “build-up” of sub-municipality population within the continuously developed area (urban area or agglomeration). ^ a b Johannesburg–East Rand and Pretoria are treated as separate urban areas which constitute the Vaal Triangle. Urban area of Vereeninging (Emfuleni) (650,000; 337 km2) is also excluded. ^ The population is higher than other agglomeration estimates (such as the United Nations), which does not include all of the continuously developed urban area in the state of Selangor. Continuous urbanization extends well beyond the municipality of Kuala Lumpur, for example to Port Klang and the area represents a single labor market (metropolitan area). The Demographia population estimate is a “build-up” of municipality population within the continuously developed area (urban area or agglomeration). Excludes urban area of Seremban (500,000; 155 km2). ^ Combination of population centres of Toronto, Hamilton and Oshawa. Excludes urban areas of Kitchener (445,000; 313 km2), London (366,000; 223 km2), St. Catharines (309,000; 378 km2), Barrie (167,000; 171 km2) and Guelph (122,000; 78 km2) which constitute the Golden Horseshoe metropolitan region in Canada as well as urban areas of Buffalo (919,000; 984 km2) and Rochester (723,000; 839 km2) in the United States. ^ Combination of San Francisco–Oakland, San Jose, Concord, Vallejo and Livermore urbanized areas. Excludes urban areas of Santa Rosa (308,000; 254 km2), Antioch (278,000; 210 km2), Salinas (185,000; 127 km2), Santa Cruz (164,000; 150 km2), Fairfield (134,000; 101 km2) and Seaside–Monterey–Marina (114,000; 101 km2). ^ Miami urbanized area. Includes former urban areas of Fort Lauderdale and West Palm Beach, which were combinde by the US Census Bureau into Miami in 2000. ^ Atlanta urbanized area. Excludes urban areas of Athens (129,000; 254 km2). ^ a b The US Census Bureau combines Washington and Baltimore into a single metropolitan area (consolidated area) but Demographia considers the two (same with Washington, DC and Baltimore urbanized areas) as separate urban areas. Urban areas of Aberdeen–Havre de Grace (214,000; 339 km2), Hagerstown (183,000; 344 km2), Frederick (142,000; 189 km2), Fredericksburg (141,000; 202 km2) and Waldorf (110,000; 176 km2) are also excluded. ^ Combination of Boston and Nashua urbanized areas. Excludes urban areas of Providence (1,187,000; 1,412 km2), Worcester (489,000; 787 km2), Barnstable (247,000; 717 km2), Manchester (159,000; 223 km2), New Bedford (149,000; 142 km2) and Leominster–Fitchburg (117,000; 168 km2). ^ Excludes urban area of Zhangzhou (1,200,000; 350 km2). ^ Excludes urban areas of Newcastle (308,000; 292 km2), Central Coast (298,000; 401 km2) and Wollongong (246,000; 219 km2). ^ Excludes urban area of Geelong (144,000; 115 km2). ^ Excludes urban areas of Ulsan (1,087,000; 104 km2) and Changwon (1,000,000; 104 km2). ^ Includes Yuci District in Jinzhong which has been excluded in the 2012 edition. ^ Detroit urbanized area. Excludes urban areas of Toledo (508,000; 622 km2), Flint (355,000; 611 km2), Ann Arbor (308,000; 414 km2) and South Lyon (120,000; 267 km2) in the United States as well as urban area of Windsor (276,000; 176 km2) in Canada . ^ Population centre of Montréal. ^ Seattle urbanized area. Excludes urban areas of Bremerton (199,000; 352 km2), Olympia (180,000; 275 km2) and Marysville (145,000; 212 km2). ^ Excludes urban area of Feira de Santana (525,000; 78 km2). ^ Excludes urban areas of Ruian (965,000; 132 km2) and Cangnan (700,000; 65 km2) within the prefecture-level city of Wenzhou. ^ San Diego urbanized area. Excludes urban area of Tijuana (1,827,000; 466 km2) in Mexico. ^ Excludes urban area of Sumqayit (275,000; 91 km2). ^ Greater Manchester urban area. Excludes urban areas of Liverpool (864,000; 200 km2), Birkenhead (325,000; 88 km2), Preston (313,000; 82 km2), Blackpool (239,000; 61 km2), Wigan (175,000; 44 km2), Warrington (165,000; 45 km2), Burnley (149,000; 36 km2), Blackburn (147,000; 36 km2) and Accrington/Rossendale (125,000; 30 km2). ^ Tampa–St. Petersburg urbanized area. Excludes urban areas of Sarasota–Bradenton (654,000; 847 km2), Lakeland (269,000; 378 km2), Winter Haven (201,000; 347 km2) and Spring Hill (149,000; 251 km2). ^ Denver–Aurora urbanized area. Excludes urban areas of Fort Collins (268,000; 285 km2), Greeley (121,000; 106 km2) and Boulder (116,000; 83 km2). ^ a b Shantou and Chaoyang–Chaonan within the prefecture-level city of Shantou are treated as separate urban areas. Likewise, urban area of Chaozhou (350,000; 85 km2) as well as urban areas of Puning (910,000; 179 km2) and Jieyang (660,000; 194 km2) within the prefecture-level city of Jieyang are excluded. ^ Excludes urban area of Ujjain (500,000; 41 km2). ^ Population centre of Vancouver. Excludes urban area of Abbotsford (150,000; 158 km2).